Financial deregulation or financial liberalization is the removal or relaxation of regulations affecting the type of business financial firms may undertake the type of firms permitted to deal in particular markets or the terms on which dealing is allowed. The first aspect was macroeconomic and the major policies were the floating of the exchange rate (with associated abolition of exchange controls) and the full implementation of the tender system for selling debt to the public so that the budget deficit was financed at market rates. These policies have produced little or no public criticism, other than the charge that they give international markets too much influence. The second aspect of financial deregulation was directed at financial intermediaries, mainly banks, with a view to increasing competition. The major policy changes were the abolition of both interest rate controls and credit guidelines and the entry of foreign banks. It is this aspect of financial deregulation that has received the most criticism in many countries. Elimination of all the administrative and regulatory statues hindering the free movement of international capital flows. During the 1960’s and the 1970’s Turkey implemented policies that supported import substitution regime for the development of the national industry. The impact of the import substitution policies are observed more intensively in the second period of the import substitution strategy which is between years. During the years 1970- 76, Turkey implemented strategies encouraging the production of intermediate and consumption goods. In this period, the national industries are protected with quotes and high rates of tariffs; thus, the rents of protection are transfered to the national capital owners. Between 1977 and 1979, Turkey experienced a problem in financing the foreign currency needs for imports. Thus, the currency gap resulted with an economic crisis. The aim of the import substitution regime was firstly raising the production of consumption goods by protecting the sectors producing these goods. As the sectors producing consumption goods improve up to a level, the production of capital and intermediate goods should be encouraged for declining the dependency of a country. As a developing country, Turkey; in 1980, the most important economical development was the economic package that was announced at 24th of January by Suleyman Demirel government. After this package, the main characteristics of the early and mid-1980s have been the promotion of the exports. 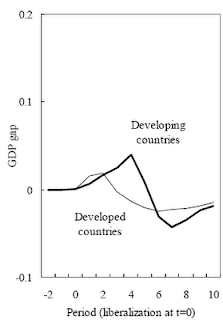 Even though the export-led growth strategy of the early 1980s was quite successful, the impressive export boom of the 1980s was essentially based on the productive capacities established during the preceding decade. Due to the developments in the capital markets, the good customers of the banks started to invest in these markets. Therefore the banks have lost their good customers and their asset quality became worse. The banks started to finance the individuals since the risks of these credits are lower than the corporate loans. The developments in electronics and computers have increased the pace in banking. The cost of the communication and the information has become lower. The inter-bank (the overdraft market between the banks) market was founded by central bank in 1986 in order to decrease the idle funds of the banks. Since June 1980, the interest rates had been determined by the banks freely according to the economical developments. The positive interest rate practice has been started since early 1980’s and due to this the banks started to take actions in order to be protected against the high costs. The banking act which is numbered as 7129 has been replaced with the new act numbered 3182 in 1985. To remove the barriers in buying and selling the stocks both in the country and abroad. To enhance the capital flow system in order to make the banks to find loans from outside. Therefore after this date the transactions with the convertible foreign currencies became legal and the foreign currencies have been started to be sold through the bank and several financial institutions in Turkey. As a result, starting from the year 1980, Turkey has experienced a trade liberalization period. After the trade liberalization, the functional income distribution is affected negatively from the policies that aimed to raise the export competitiveness of the country. The wage shares had shown a declining trend after the year 1980. In the year 1989, Turkey experienced a financial liberalization. The financial liberalization raised the instability in the financial markets. With the impact of capital outflows two economic crises occurred in the years 1994 and 2001. The share of wages declined severely with the effect of the economic crises. After the economic crisis in 2001, according to the official statistics, income inequality started to follow a consistent declining path. The Gini coefficient estimated declined from 0.44 to 0.38 between years 2002-2005. This value is far lower than the Gini coefficient of the year 1994, which is a year that another economic crisis is experienced. The Gini coefficient in Turkey was calculated as 0.49 in the year 1994. The revolution attack may cause some gaps in the financial procedures regarding the legal issues. The financial institutions may tend to give more risky loans to their customers. The interest and the credit risks of the financial institutions may increase. The asset and liability balance may be spoilt. The banking sectors in several countries have faced many problems and due to this they have dealt with big losses and they couldn’t overcome this burden. Therefore, several banks couldn’t adopt themselves to the new environment and the system has gone bankruptcy in some countries. In order to visualize this we can give US banks as an example. 1978: Supreme Court allows banks to export the usury laws of their home state nationwide and sets off a competitive wave of deregulation, resulting in the complete elimination of usury rate ceilings in South Dakota and Delaware, among others. 1980: Depository Institutions Deregulation and Monetary Control Act – Legislation increases deposit insurance from USD 40,000 to USD 100,000, authorizes new authority to thrift institutions and calls for the complete phase-out of interest rate ceilings on deposit accounts. 1982: Garn-St. Germain Depository Institutions Act – The thrifts were deregulated almost entirely, allowing commercial lending and providing for a new account to compete with money market mutual funds. This was a Reagan administration initiative that passed with strong bi-partisan support. 1987: FSLIC Insolvency –The deposit insurance fund of the savings and loan industry was insolvent as a result of mounting institutional failures. 1989: Financial Institutions Reform and Recovery Act – Act abolishes the Federal Home Loan Bank Board and FSLIC, transferring them to OTS and the FDIC, respectively. The plan also creates the Resolution Trust Corporation to resolve failed thrifts. 1994: Riegle-Neal Interstate Banking and Branching Efficiency Act – This bill eliminated previous restrictions on interstate banking and branching. It passed with broad bipartisan support. 1996: Fed Reinterprets Glass-Steagall – Federal Reserve reinterprets the Glass-Steagall Act several times, eventually allowing bank holding companies to earn up to 25% of their revenues in investment banking. 1998: Citicorp-Travelers Merger – Citigroup Inc. merges a commercial bank with an insurance company that owns an investment bank to form the world’s largest financial services company. 1999: Gramm-Leach-Bliley Act – With support from Fed Chairman Greenspan, Treasury Secretary Rubin and his successor Lawrence Summers, the bill repeals the Glass-Steagall Act completely. 2000: Commodity Futures Modernization Act – Passed with support from the Clinton Administration, including Treasury Secretary Lawrence Summers and bi-partisan support in Congress. The bill prevented the Commodity Futures Trading Commission from regulating most over-the-counter derivative contracts, including credit default swaps. 2004: Voluntary Regulation – The SEC proposes a system of voluntary regulation under the Consolidated Supervised Entities program, allowing investment banks to hold less capital in reserve and increase leverage. 2007: Subprime Mortgage Crisis – Defaults on subprime loans send shockwaves throughout the secondary mortgage market and the entire financial system. December 2007: Term Auction Facility – Special liquidity facility of the Federal Reserve lends to depository institutions. Unlike lending through the discount window, there is no public disclosure on loans made through this facility. March 2008: Bear Stearns Collapse – The investment bank is sold to JP Morgan Chase with assistance from the Federal Reserve. March 2008: Primary Dealer Facilities – Special lending facilities open the discount window to investment banks, accepting a broad range of asset-backed securities as collateral. July 2008: Housing and Economic Recovery Act – Provides guarantees on new mortgages to subprime borrowers and authorizes a new federal agency, the FHFA, which eventually places Fannie Mae and Freddie Mac into conservatorship. October 2008: Emergency Economic Stabilization Act – Bill authorizes the Treasury to establish the Troubled Asset Relief Program to purchase distressed mortgage-backed securities and inject capital into the nation’s banking system. Also increases deposit insurance from USD 100,000 to USD 250,000. Late 2008: Money Market Liquidity Facilities – Federal Reserve facilities created to facilitate the purchase of various money market instruments. March 2009: Public-Private Investment Program – Treasury Secretary Timothy Geithner introduces his plan to subsidize the purchase of toxic assets with government guarantees. Beyond the banking failures and the financial deregulation happenings in US, there are other studies that have been done on the countries that have accepted the financial deregulations in their economies. 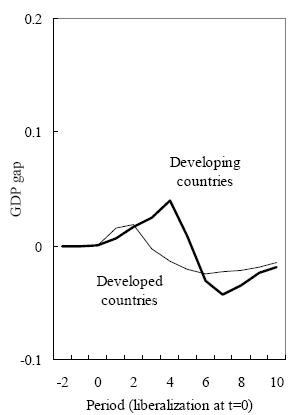 It was concluded that the countries which had faced financial deregulations had big differenced in their GDP. This is explicitly shown in the following figure. Up to now, we have tried to explain what the consequences of the financial liberalizations are. This showed that the financial liberalizations are imporatnt and necessary up to a level. But, above that level, the consequences might be hazardous to all countries. The recent global crisis was told as a result of the deregulatory environment. It is said that at least five distinct regulatory failures led to the current crisis. Failure to Manage the US Trade Deficit: The housing bubble (as well as the surge in leveraged buyouts of publicly traded companies (“private equity”)) was fueled by cheap credit. One reason for the cheap credit was an influx of capital into the US from China. China’s capital surplus was the mirror image of the US trade deficit -- US corporations were sending lots of dollars to China in exchange for the cheap stuff sold to US consumers. Failure to Intervene to Pop the Housing Bubble: Along with an influx of capital, Federal Reserve policy kept interest rates very low. There were good reasons for the Fed Policy but that did not mean the Fed was helpless to prevent the housing bubble. As economists Dean Baker and Mark Weisbrot of the Center for Economic and Policy Research insisted at the time, Federal Reserve Chair Alan Greenspan simply by identifying the bubble -- and adjusting public perception of the future of the housing market -- could have prevented or at least contained the bubble. He declined and even denied the existence of a bubble. Financial Deregulation and Unchecked Financial “Innovation”: A key reason that mortgages were made available so widely and with such little review of recipients’ qualifications was a shift in which institutions hold the mortgages. Traditionally, banks made mortgages and held them. In the new era, banks and non-bank mortgage lenders made loans but then sold the loans to others. Investment banks packaged lots of mortgage loans into “Collateralized Debt Obligations” (CDOs) and then sold them on Wall Street, with a promise of a steady stream of revenue from interest payments. These operations were pretty much unregulated. Despite the supposed sophistication of the investors involved, no one took account of how shoddy the loans were or -- more fundamentally -- the certainty that huge numbers would go bad if and when the housing bubble popped. Private Regulatory Failure: It was the job of ratings agencies (like Standard and Poor’s and Moody’s) to assess the CDOs and give investors guidance on how risky they were. They failed totally, likely in part because they wanted to maintain good relations with the investment banks issuing the CDOs. No Controls over Predatory Lenders: The toxic stew of financial deregulation and the housing bubble created the circumstances in which aggressive lenders were nearly certain to abuse vulnerable borrowers. The terms of your loan don’t matter, they effectively purred to borrowers, so long as the value of your house is going up. Lenders duped borrowers into conditions they could not possibly satisfy, making the current rash of foreclosures on subprime loans inevitable. Effective regulation of lending practices could have prevented the abusive loans but none was to be found. As seen from above, there are for and against ideas about both globalization and financial deregulation. However, we know hat these two terms are essential for the investments done to a foreign country. By defining these two terms we have tried to show how the economies started to interact with each other by means of different economic parameters such as foreign currencies, imports or exports, financial investments, capital flow etc. I.J. Macfarlane, “Financial Deregulation and Financial Markets”, Reserve Bank of Australia Bulletin, May 1995, p.8. Tim S.Campbell, Financial Institutions, Markets, and Economic Activity, USA: McGrawHill, 1982, p. 365. Sun A Lee, “A Comparative Study of Chinese and Turkish Economic Reform Policies in the Age of Globalization”, Master Thesis, Bilkent University SBE, 2006, s.14. Cem Oyvat, “Globalization, Wage Shares and Income Distribution in Turkey”, Master Thesis, İTÜ SBE, 2008, p.2-3. Mehmet Takan, Bankacılık Teori, Uygulama ve Yönetim, Ankara, Nobel, 2001, p. 7-10. Thomas P.Fitch, Dictionary of Banking Terms, New York, Barron’s, 2000, p. 239. Ömer Faruk Çolak, Finansal Piyasalar ve Para Politikası, Ankara, Nobel, 2001, p. 77. Matthew Sherman, A Short History of Financial Deregulation in the United States, US, Center for Economic and Policy Research, 2009, p.1-2. Charles Wyplosz, “How Risky is Financial Liberalization in the Developing Countries?”, G-24 Discussion Paper Series, United Nations, No:14, September 2001, p.5.